An old man enjoying the swansong of semi-retirement is distracted from his otherwise mundane and moderately happy daily existence by an unexpected letter bequeathing him a mysterious item in the will of an old acquaintance. The news triggers a profound reflection on long forgotten memories of first love and lost friends. Jim Broadbent brings the full force of his gruffly winsome charm to a leading role that carries audiences along a leisurely voyage of unlikely self-discovery. It’s hard to imagine many other actors capable of portraying a character who is somehow simultaneously a selfish curmudgeon and yet also still a jovial sympathetic figure. Broadbent’s screen presence is the glue that holds together a relatively straightforward and uneventful story with a sense of purposefully profound gravitas. Around Broadbent’s typically accomplished leading man a supporting cast including Charlotte Rampling and Michelle Dockery competently do their parts. The film also manages to create at the very least a convincing continuity between Broadbent’s increasingly muddled recollections and his present day preoccupations. Rich cinematography and a close eye for details ensures that the film’s driving message about the fluid nature of time and our most precious memories is not lost amongst the persistent flashbacks. Most importantly the film also avoids slipping into predictable melodrama or other clichés. The film is neither a heavily romanticized nostalgic romp nor a sad lament of the frailties and frustrations of old age. Instead the film maintains a calm and well considered focus on the more abstract and intriguing theme of memory. At its heart the film is as much about our own daily efforts to write the narratives of our lives and the relative ease with which over time we can begin to become deluded or mistake in even the most fundamental details of our personal histories. Inevitably younger audiences may find it harder to identify with the film’s core musings about old age and the imprecise records of our own memories. Of course the same criticism could be made about the countless coming of age dramas, with older audiences equally disconnected form adolescent anxieties. However, while common experience may make stories about youthful emergence into adulthood more universally appealing, it’s fair to say that stories dwelling on more mature self-reflection are often treated as a far more niche genre. In all honesty if you strip away Broadbent’s capable screen presence what remains is a slow paced and unremarkable story with most of its more dramatic moments played out off screen. Though the film does well to maintain at least a certain degree of audience curiosity about the true nature of the characters’ pasts, sadly when those answers do finally come they’re revealed in an understated way that is only moderately satisfying. Of course the elusive nature of memory and the inevitable shortcomings of looking to the past for answers is entirely the point of the story. Nevertheless it often feels like some of the most dramatic and sensational parts of the story are simply missing. Broadbent is a likeable narrator but his character is simply not equipped to deliver the satisfying spectacle of storytelling that audiences are accustomed to being more readily spoon-fed. Ultimately leaving audiences to fill in too many narrative gaps might help the film drive home its message about unreliable memories, but it does risk leaving some spectators feeling at least a little unfulfilled. 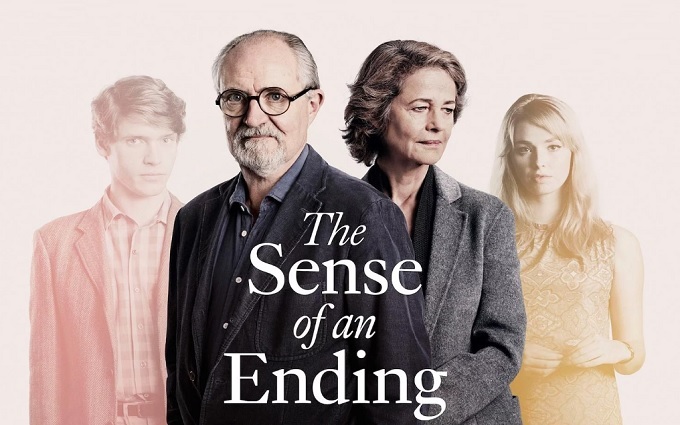 A solid cast lead by Jim Broadbent manage to deliver a slow moving but largely satisfying story tinged with both occasional flashes of humour and a wistful melancholy.